1:7 scale Stonewall Bricks, signed and numbered edition of 50. Earthenware and pen. 1” x .5” x .3” each. “The forces of faggotry, spurred by a Friday night raid on one of the city’s largest, most popular and longest lived gay bars, the Stonewall Inn…” began the July 3, 1969 Village Voice article by Lucian Truscott IV. The article, and many others like it, goes on to list the objects hurled at police; bottle caps, loose change, cobblestones, bricks, expressing an immediacy in riot tools. This is not surprising - in the heat of moments of oppression, one can imagine the quick-thinking and reaching for the most accessible objects needed with which to fight back. Bricks are conceptually and materially loaded objects. Most often my mind goes first to the trans vernacular slang term Brick to refer to trans women who do not pass as cis women. What does it mean to consider the Brick (person) as also the weapon? The Protester and protest tool. 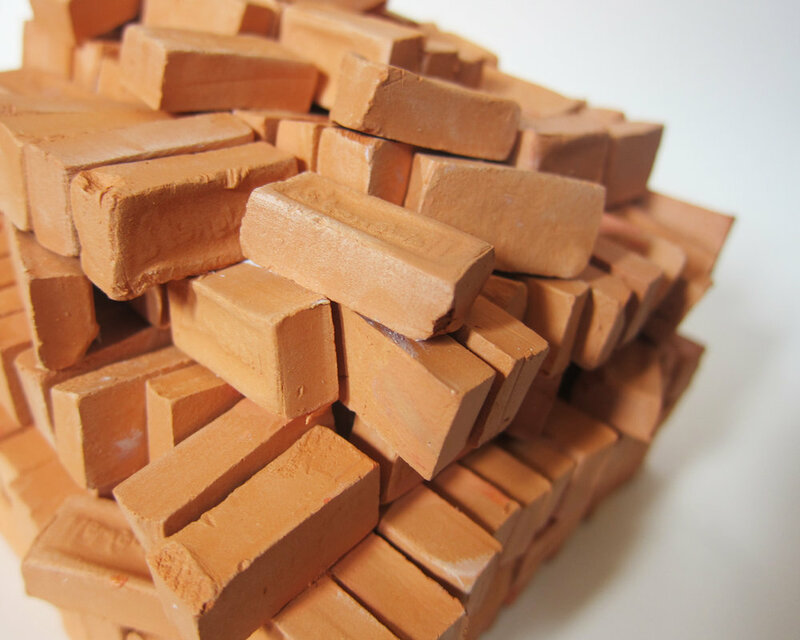 Materially, bricks as building materials today are incredibly frivolous; heavy and small, expensive and inconvenient, but they exist still they are made of earth, fired ceramic, a material that is permanent. The brick as a riot tool exists so ubiquitously in the oral and textual histories of rising up because of how universal it is. The brick as an afterthought, yet when clutched in the hand of a protestor, becomes ideal for destruction - proportional to the adult human hand (they were designed to be hand-laid, after all), heavy for their size, rigid and indestructible. What would a brick look like if it were designed for a specific riot? A specific community? Civilization and industry can also be traced through the markings on bricks’ surfaces. For the 50th anniversary and re-memorialization of Stonewall, I designed a Stonewall “brand” brick, both identifying the object as a riot tool first and foremost in the context of queer liberation, and the acknowledging the iconography of Stonewall as a recognizable and pivotal moment in American queer history. These bricks were produced in a quantity of “over two-hundred” in reference to the controversial July 6th 1969 New York Daily News article by Jerry Lisker where he recounts imprecisely that “Police said there were over 200 people in the Stonewall when they entered with a warrant.” This monument exists as a loose stack of “over two hundred” bricks, representing the bodies of the bar-goers at the time of the raid. The stack to be set in Christopher Park is unfixed and flexible. It’s lack of rigidity complicates its monument status and speaks more directly to the fluidity of community dynamics, of the recording of histories. This unassuming pile of commemorative objects pays homage to the Bricks, those visible queers, who fought for their and ultimately our lives that balmy night, expressing a collectivity that is continually evolving, shifting, spreading. This is the very nature of queerness and its potential for changing the world around it. A pile of materials with which to build, sure, and also a collection of objects ripe for revolution.